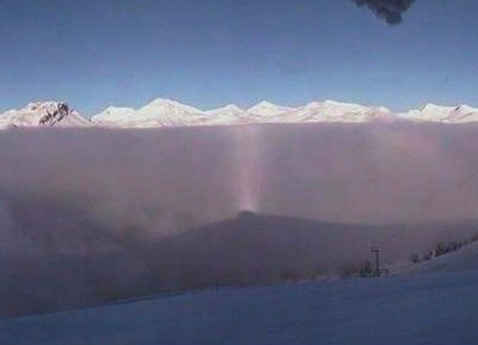 This white pillar rising from the subanthelic point was captured by the Swiss panorama webcam of Davos Rinerhorn (2281m) a bit more than a year ago on 14 November 2008. The picture was submitted by Bertram Radelow. By clicking on it, you get to Bertram's homepage, where you will see the full-size version of three images from the period between 8:30 and 10:00 local time. but the best pic (not mentioned here) is http://radelow.ch/halo/pgsb02.htm in my opinion. Does somebody know, what the exact names are for the lower sharp arc and the more diffuse upper arc? To me this looks like a diffuse arc (B-komponent crosses both anthelic and subanthelic points) and I get a decent simulation for about sun elevation 6 degs. But the time in the photo is 9:01, which gives about 14 degs elevation and corresponding simulation does not match. So, either I made a mistake in the sun elevation, or the clock is wrong (summer time, perhaps), or we have there something we don't understand. However, if you look at the three images on Bertram's page, in the uppermost the pillar is narrowest, in the middle one a bit wider and in the lowermost there seems to be even wider stumps of arcs. That's how the diffuse B behaves when sun gets higher. I don't really see two arcs there, just one. The new image is not from the same display. That seems like diffuse arc again - with some glory.